While many drivers are alarmed to see it, Californians know not to get spooked when a motorcyclist lane splits down the highway. After lengthy and contentious debates between state government agencies about the safety of lane splitting, the law enabling motorcycles to weave in and out of lanes was officially passed in August 2016. Today, California remains the only U.S. state to allow lane splitting (the practice is legal in Europe and Asia), and researchers and motorcycle experts say that lane splitting can actually reduce traffic and improve roadway safety. Norris isn’t the only person to be surprised to learn about the freedom motorcyclists have on California roads. Although politicians and experts have emphasized the various benefits of lane splitting, around 16% percent of accidents are a result of motorcycles surreptitiously passing cars between lanes. However, the law was established for a reason, and according to a University of California – Berkeley study, lane-splitting motorcyclists are less likely to suffer from a physical injury than motorcycles that stay put in lanes. Here are three ways lane splitting helps both drivers and motorcyclists. 1. Time. In the Bay Area, Los Angeles, and other urban pockets of California, bumper-to-bumper traffic is a regular part of everyday life. During rush hour in Los Angeles, it can take an hour to drive a mile across town. 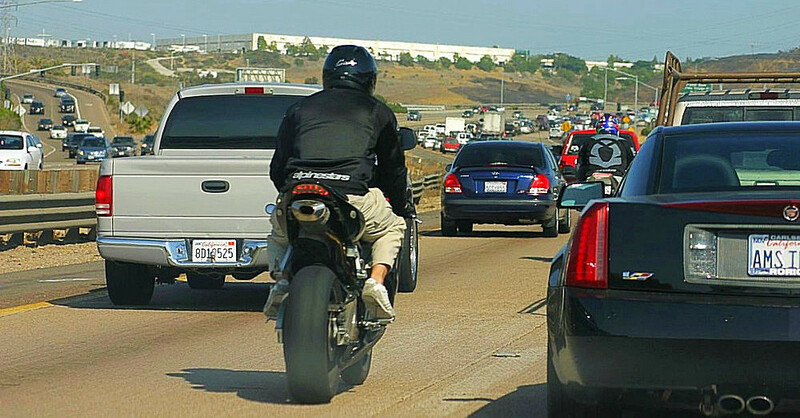 By utilizing lane splitting, motorcyclists can avoid excruciating congestion. One commuter told LA Weekly that he cuts his morning commute from 50 minutes to 25 by scooting past gridlock traffic on his motorcycle. 2. Reducing your carbon footprint. By allowing motorcycles to bypass cars, we’re decreasing the number of vehicles emitting exhaust on the road. According to a report from Transport & Mobility Leuven, a Belgian analysis firm, if 10% of cars were replaced with motorcycles then traffic time would be cut by 63% for all drivers, and carbon emissions would decrease by 6%. 3. It’s safe. Rear-end accidents are some of the most common collision example in the U.S. By decreasing the number of vehicles behind you, your chances of getting rear-ended are also reduced. There are some precautions to keep in mind when lane splitting: be sure to stay in the 50-miles-per-hour range and avoid driving faster than 15 miles-per-hour of the other vehicles in your lane. Learn more about the benefits of knowing motorcycle safety. Read "How Learning to Ride a Motorcycle Made Me a Better Driver" on our blog.